Introduced externalities. The usual examples, pollution, good manners and flatulance. However, I also emphasized an externality we had dealt with all semester: when I buy a particular Picasso it prevents you from doing so, exerting a negative externality on you. I did this to point out that the problem with externalities is not their existence, but whether they are `priced’ into the market or not. For many of the examples of goods and services that we discussed in class, the externality is priced in and we get the efficient allocation. What happens when the externality is not `priced in’? The hoary example of two firms, one upstream from the other with the upstream firm releasing a pollutant into the river (That lowers its costs but raises the costs of the downstream firm) was introduced and we went through the possibilities: regulation, taxation, merger/ nationalization and tradeable property rights. Discussed pros and cons of each. Property rights (i.e. Coase), consumed a larger portion of the time; how would you define them, how would one ensure a perfectly competitive market in the trade of such rights? Nudged them towards the question of whether one can construct a perfectly competitive market for any property right. To fix ideas, asked them to consider how a competitive market for the right to emit carbon might work. Factories can, at some expense lower carbon emissions. We each of us value a reduction in carbon (but not necessarily identically). Suppose we hand out permits to factories (recall, Coase says initial allocation of property rights is irrelevant) and have people buy the permits up to reduce carbon. Assuming carbon reduction is a public good (non-excludable and non-rivalrous), we have a classic public goods problem. Strategic behavior kills the market. Some discussion of whether reducing carbon is a public good. The air we breathe (there are oxygen tanks)? Fireworks? Education? National Defense? Wanted to highlight that nailing down an example that fit the definition perfectly was hard. There are `degrees’. Had thought that Education would generate more of a discussion given the media attention it receives, it did not. Concluded with an in depth discussion of electricity markets as it provides a wonderful vehicle to discuss efficiency, externalities as well as entry and exit in one package. It also provides a backdoor way into a discussion of net neutrality that seemed to generate some interest. As an aside I asked them whether perfectly competitively markets paid agents what they were worth? How should one measure an agents economic worth? Nudged them towards marginal product. Gave an example where Walrasian prices did not give each agent his marginal product (where the core does not contain the Vickrey outcome). So, was Michael Jordan overpaid or underpaid? With respect to entry and exit I showed that the zero profit condition many had seen in earlier econ classes did not produce efficient outcomes. The textbook treatment assumes all potential entrants have the same technologies. What if the entrants have different technologies? For example, solar vs coal. Do we get the efficient mix of technologies? Assuming a competitive market that sets the Walrasian price for power, I showed them examples where we do not get the efficient mix of technologies. An unintentionally amusing missive by Marion Fourcade, Etienne Ollion and Yann Algan’s discovers that the Economics profession is a self perpetuating oligarchy. This is as shocking as the discovery of gambling in Casablanca. Economists are human and respond to incentives just as others do (see the Zingales piece that makes this point). Are other disciplines free of such oligarchies? Or is the complaint that the Economist’s oligarchy is just order of magnitudes more efficient than other disciplines? The abstract lists three points the authors wish to make. 1) We begin by documenting the relative insularity of economics, using bibliometric data. A former colleague of mine once classified disciplines as sources (of ideas) and sinks (absorbers of them). One could just as well as describe the bibliometric data as showing that Economics is a source of ideas while other social sciences are sinks. if one really wanted to put the boot in, perhaps the sinks should be called back holes, ones from which no good idea ever escapes. 2) Next we analyze the tight management of the field from the top down, which gives economics its characteristic hierarchical structure. 3) Economists also distinguish themselves from other social scientists through their much better material situation (many teach in business schools, have external consulting activities), their more individualist worldviews, and in the confidence they have in their discipline’s ability to fix the world’s problems. If the authors had known of this recent paper in Science they could have explained all this by pointing out that Economists are wheat people and other social scientists are rice people. “Past experience shows that most of the time, during six months after elections the stock market was at a higher level than before the elections,” emphasized Zbezinsky (the chief economist, ES). 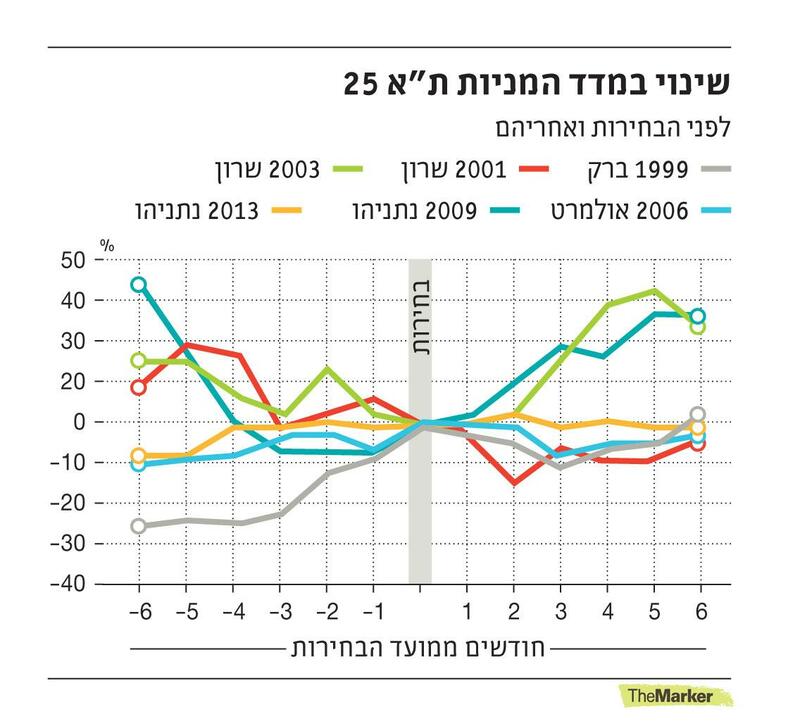 The Meitav-Dash investment house checked the performance of the TA-25 Index (the index of the largest 25 companies in the Israeli stock exchange, ES) in the last six elections. They compared the index starting from 6 months before elections up to six months after elections, and the result was that the average return is positive and equals 6%. Six data points, this is all the guy has. And from this he concludes that “most of the time” the market increased. Well, he is right; the index increased four times and decreased only twice. Election is due 17-March-2015, which means three and a half months. In particular, taking as a baseline 6 months before election is useless; this baseline is well into the past. Some of the colored lines seem to fluctuate, suggesting that some external events, unrelated to elections, may have had an impact on the stock market, like the Intifada in 2001 or the consequences of the Lebanon war before the 2009 elections. It might be a good idea to check whether some of these events are expected to occur in the coming nine months and a half. It will also be nice to compare the performance around elections to the performance in between elections. Maybe 6% is the usual performance of the TA-25, maybe it is usually higher, and maybe it is usually lower. I am sure that the readers will be able to find additional points that make the chief economist statement irrelevant, while others may find points that support his statement. I shudder to the thought that this guy is in charge of some of my retirement funds.